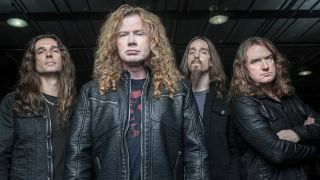 Megadeth leader Dave Mustaine says the band are hoping to have their new studio album out in the spring of next year. Now it looks like it might be coming sooner rather than later next year. Speaking with Eddie Trunk’s SiriusXM broadcast Live From The Rainbow Bar And Grill, Mustaine said (via Blabbermouth): “We're just assembling all the pieces right now. “Guitarist Kiko Loureiro and drummer Dirk Verbeuren have both been out to the studio to start recording and we're now in the process of finalising all the arrangements. He adds: “And that's how I feel. I watch him play and I just laugh because when I play live, I'm not looking at him, I’m looking at the audience, so I don't really see. Megadeth will set sail on the first-ever Megacruise between October 13-18, 2019, where they’ll be joined by Armored Saint, Anthrax, Devildriver, Corrosion Of Conformity, Testament, John 5, Doro, Danko Jones, Beasto Blanco, Metalachi and Metal Church. The band will also head out on the road with Ozzy Osbourne next year on the latest leg of Ozzy’s No More Tours 2 run of North American shows.